The Branford Boase Award is awarded annually for an outstanding first novel to a first-time writer of a book for young people, from ages 7 upwards. At the same time, it marks the important contribution of the editor in identifying and nurturing new talent. The Winner of The Branford Boase Award 2018 has just been announced! 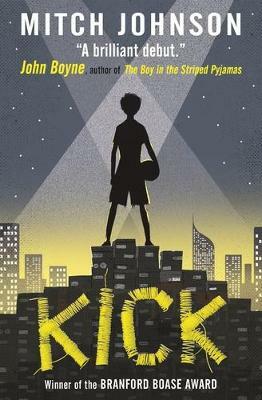 Mitch Johnson, and editors Rebecca Hill and Becky Walker of Usborne,win this prestigious award for the outstanding novel, Kick. The judges described Kick as "a beautifully crafted story" and "It brilliantly captures the way the football-crazy child sees the world". Sharon Cohen and her editor Sarah Lambert were Highly Commended by the judges for The Starman and Me. Now in its 19th year the Branford Boase Award is recognised as one of the most important awards in children’s books with an impressive record in identifying authors with special talent at the start of their careers. Uniquely, it also honours the editor of the winning title and highlights the importance of the editor in nurturing new talent. This year the judges are Urmi Merchant of children’s bookshop Pickled Pepper Books; Helen Swinyard, librarian at Heartlands High School and founder of the Haringey Children’s Book Award; reviewer Philip Womack; and M.G. (Maya) Leonard, author of Beetle Boy, winner of the 2017 Branford Boase Award. The panel is chaired by Julia Eccleshare, children’s director of the Hay Festival and Lovereading expert reviewer. The Branford Boase Award was set up in memory of the outstanding and prize-winning author Henrietta Branford and Wendy Boase, editorial director and one of the founders of Walker Books. They worked together on a number of Henrietta’s novels, a partnership they greatly enjoyed. Henrietta Branford was a gifted novelist for young people. During her short career she won the Smarties Prize in 1994 for Dimanche Diller (Harper Collins) and the Guardian Fiction Prize in 1998 for Fire, Bed and Bone (Walker Books); she was twice shortlisted for the Guardian Fiction Prize, in 1994 and 1997. Her progress and development as a writer was watched with interest by publishers, critics and fellow writers alike. Wendy Boase, Editorial Director of Walker Books, and one of its founders, was a passionate children's book editor wholly committed to developing new writers and nursing them through their early writing careers. She is credited with bringing on many new talents. She and Henrietta worked together on a number of her books, a partnership that was warmly appreciated by Henrietta. Both Henrietta and Wendy died of cancer in early 1999. The Branford Boase Award wishes to celebrate and encourage, in their names and in their memories, the crucial early development of new writing talent. Running alongside the Branford Boase Award, the Henrietta Branford Writing Competition encourages writing talent in under 18s. The shortlist for the Branford Boase was published on the 2 May and the winner was announced in July 2018 at a ceremony in London, winning a cheque for £1,000 and both author and editor received a unique, hand-crafted silver-inlaid box. For a full list of the Longlisted titles click here. For more information on the Branford Boase Award visit www.branfordboaseaward.org.uk.